Hunter Douglas Design Studio™ Roman shades feature over 300 timeless fabric and colour combinations, coordinating decorative tapes and trims, and edited selection of shade and valance styles, and superior craftsmanship. Fabrics include cottons, linens, silks and synthetic fibers from around the world. Design Studio Fabrics are woven in widths that allow shades to be made up to 96″ wide without being interrupted by seams. Every shade offers high quality construction. The innovative cording system reduces access to the rear cords for enhanced child safety. Clear rings coordinate with all the linings and sheers. Stiff battens provide structure. Batten tunnels are sewn to keep battens from slipping out. All hems are double turned for a custom finished look, with bottom hems weighted for a smooth appearance. The Roman Shades are available in four styles, batten front, batten back, flat and hobble. You can select from light filtering or room darkening linings to back your roman shades. 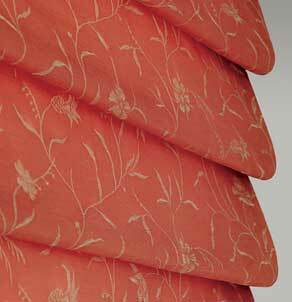 Fabric by the yard is also available if you wish to have custom draperies or bedding made to match you roman shades. This Exclusive product line is only available at specific Storefront locations. Drop by Sheila’s Window Toppers at Crowfoot to view this beautiful Hunter Douglas collection today. Learn more about Design Studio Roman Shades.